Mission Team: Keith Valentine, Matt Schwartz, David Malencon, Bo Nagahi, David Schwartz, M.D., Kade Huntsman M.D., and Pitchou Malaba. The NSF mission team arrived in Nairobi, Kenya the night of Wednesday, June 21. The team hit the ground running on the first day, concentrating on planning, logistics, and instrument and implant inventory. One of the highlights on the first day was visiting Salma’s former elementary school where the mission team donated school items and spent time with the children. The children were very excited to see Salma and to meet her American friends at the school. The NSF mission team performs life-changing surgery at Kenyatta National Hospital, June 2012. Each morning at 6:00 a.m. we kicked off the day with a group breakfast, boarded the bus, and arrived at Kenyatta National Hospital by 7:00 a.m. The local surgeons and mission trip surgeons were anxious to get started. Once we arrived at the hospital, we reviewed patients in the clinic and triage, as well as sorted instruments and implants in an attempt to avoid logistical challenges during scheduled procedures. Upon arriving, it was clear that the Kenyan hospital surgeons and staff were well prepared and advertised that the mission team was arriving to perform spine surgery. There were over 60 patients in the clinic along with local news coverage. 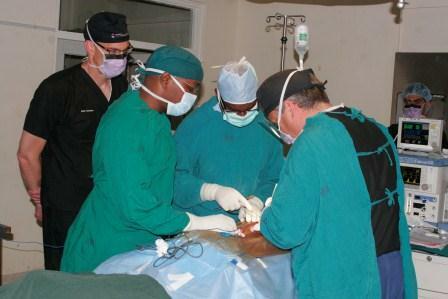 Every surgical case had up to five African surgeons scrubbed-in or was observing for training purposes. While on the mission trip the team came across a special patient. Initially introduced in February 2012, Alison, age 12, was diagnosed with adolescent idiopathic scoliosis (AIS) and was prepared in February to receive spine surgery. 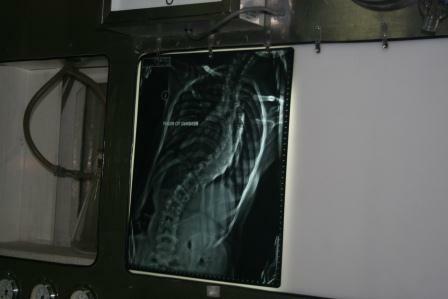 Alison’s x-ray pre-surgery at Kenyatta National Hospital. After taking inventory, it was apparent that the team did not have the correct instrumentation on hand to perform her surgery. 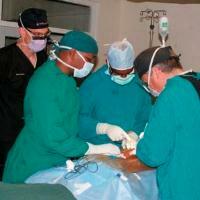 Desperate, Alison returned again to Kenyatta National Hospital in June with her parents. At age 12, Alison was suffering from debilitating back and leg pain that was preventing her from running and playing with her friends. She tired quickly from the pain and was unable to perform even the simplest daily activities (especially her house chores!). 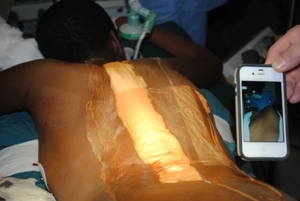 After Alison returned in June, the mission team was determined to perform her surgery. After taking inventory of the necessary instruments and implants, it was apparent that yet again, the team did not have the correct instrumentation to perform Alison’s long awaited, life-changing surgery. Making a quick decision, the team scrambled to order the necessary instrumentation – overcoming any obstacle to perform this surgery.Everyone from the hospital staff to FedEx was on board to rush order and deliver these lifesaving tools. 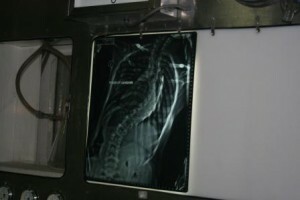 Alison’s post-surgery results compared to her spine pre-surgery. After FedEx delivered the instruments, the delivery man asked how Alison was doing. This truly touched the mission team and exhibits the significant impact the Foundation has made on the local community. After performing a successful T4-L1 fusion, Alison is now playing and running like every other 12-year-old, pain free. In conclusion, all 12 patients who received live-changing surgery felt blessed and lucky to be treated by the best spine surgeons at no cost. Some patients called it a “miracle” – changing their lives forever.